This introduction to the role of information structure in grammar discusses a wide range of phenomena on the syntax-information structure interface. 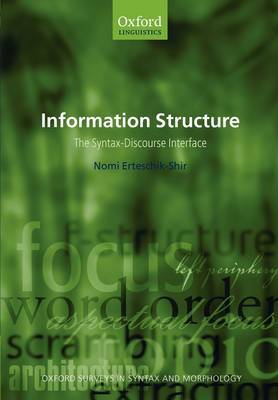 It examines theories of information structure and considers their effectiveness in explaining whether and how information structure maps onto syntax in discourse. Professor Erteschik-Shir begins by discussing the basic notions and properties of information structure, such as topic and focus, and considers their properties from different theoretical perspectives. She covers definitions of topic and focus, architectures of grammar, information structure, word order, the interface between lexicon and information structure, and cognitive aspects of information structure. In her balanced and readable account, the author critically compares the effectiveness of different theoretical approaches and assesses the value of insights drawn from work in processing and on language acquisition, variation, and universals. This book will appeal to graduate students of syntax and semantics in departments of linguistics, philosophy, and cognitive science.